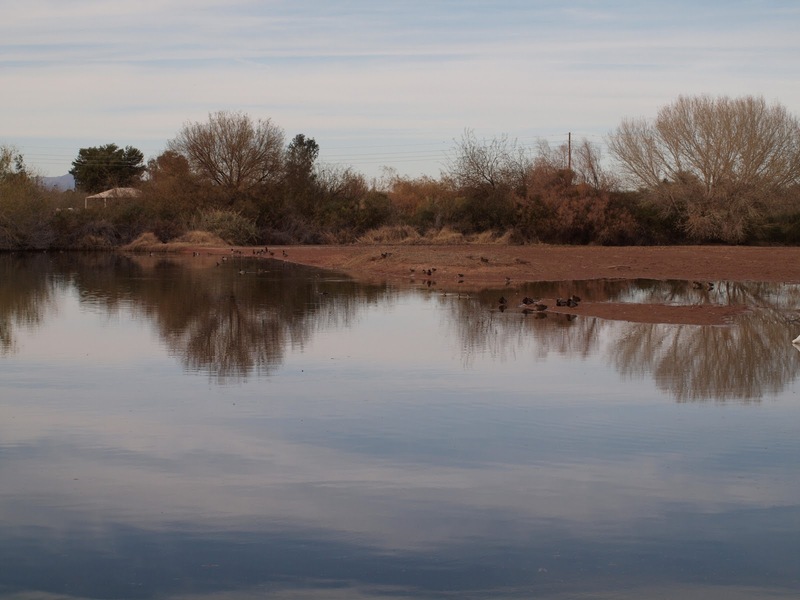 One of Arizona's many birding Disneylands is within about a half hour of the Phoenix airport. It is officially called "Riparian Preserve at Water Ranch" by the Gilbert Riparian Institute, but now known worldwide by birders as "Gilbert Water Ranch". This series of seven shallow ponds which are cyclically raised, lowered, and sometimes emptied create an oasis of mud flats for shorebirds and waterfowl. The nature trails winding their way around the 110 acres make for easy bird viewing. 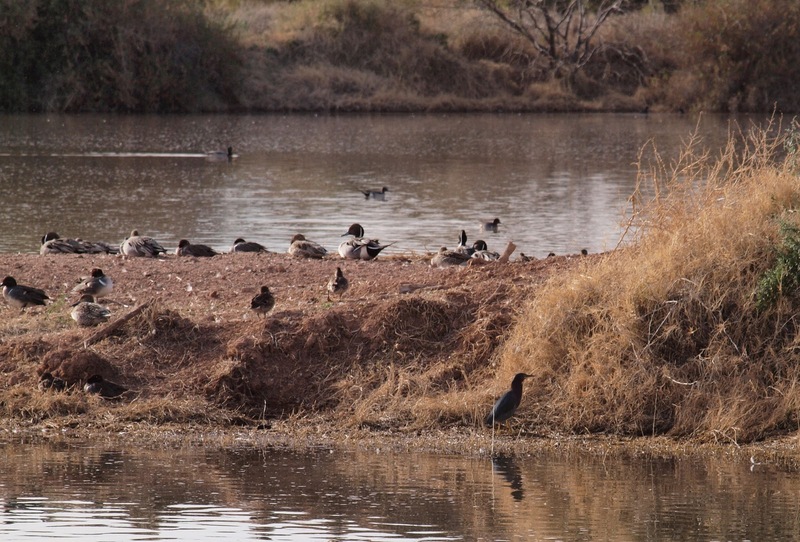 The southwestern native trees, shrubs, and plants surrounding the ponds make for excellent habitat for a whole host of other birds. The Water Ranch boasts approximately 270 species (per eBird submissions), 200 of which are seen regularly through the year. Rarities seem to be common here. 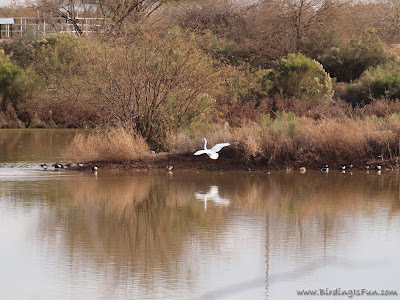 I got my start in birding in when I lived in Mesa, Arizona and visited the Gilbert Water Ranch about a dozen times. 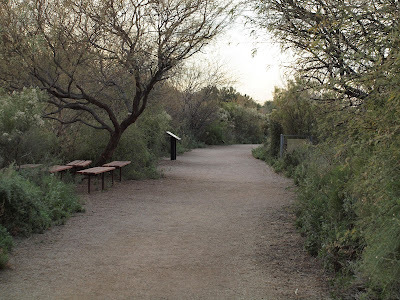 The first "bird walk" I ever attended in a group setting was there. I wish I could remember the lady's name that led the group...she was a great mentor and very encouraging. I owe 36 of my life birds to the Gilbert Water Ranch including the Streak-backed Oriole in November 2006 and most recently a Ruddy Ground-dove. "Absence makes the heart grow fonder" - a statement that I realized is so true when I was able to briefly visit the Water Ranch last week after coming to Phoenix for a business trip. When I was a beginning birder, I didn't recognize the treasure trove that I lived so near. Now with several more years of birding experience under my belt, I walked around the Water Ranch like a smiling kid who just met Mickey Mouse. There are some disadvantages to the Gilbert Water Ranch. First, there are a lot of people there using the facilities: bicyclists, dog walkers, plant enthusiasts, astronomers, photographers, school groups, scout groups, etc. So the best time to visit for birding is early in the morning or during business hours when less people are there. I also tend to get myself a bit lost through the maze of trails, so print yourself off a map before you go. There is also a feral cat problem there which is a continuing source of debate among the locals which still rages on after several years. The Burrowing Owls seem to have been killed or scared off leaving dozens of nice man-made burrows awaiting their return. It is so easy to overlook these challenges when you have Anna's and Costa's Hummingbirds buzzing your head and posing for pictures! Green-winged Teal, Northern Pintails, Green Heron, and more! 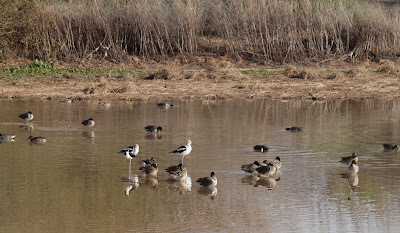 Over the next few days I will be posting pictures of birds I enjoyed in just a couple of hours at one of Arizona's fine birding hotspots, Gilbert Water Ranch. Robert, your description makes me envious. We are buried here up to the eaves in snow and you are walking around a spectacular birding reserve under blue skies and warm sunshine, I assume. @Hilke - when I left Salt Lake it was near blizzard conditions. When I arrived in Arizona, it was paradise! I miss AZ winters and AZ birds. Wow, you are getting aorund to all of my old stomping gorunds! The first time I ever went there it was to see a vagrant Wood Stork! Visiting your blog nowadays is like a window on a world I use to live in! What a ncie surprise this post was for me! p.s. just read your comment to Hilke, and wanted to say that my husband would agree with you! Especially now as we ARE in the midst of yet another snow storm! liked the shot with the Avocets. @Hap - There were Black-necked Stilts, lots of Long-billed Dowitchers, Least Sandpipers, and I did see one Greater Yellow-legs. There was one other peep, possible a Western Sandpiper, but I didn't observe it long enough to be certain.